← Charles Bradlaugh: Forgotten Hero? 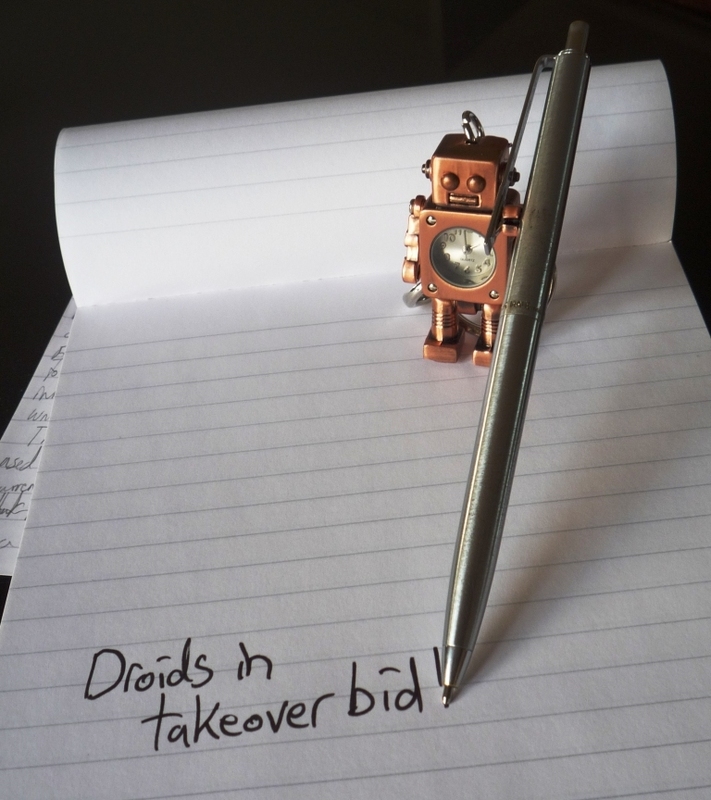 I’ve heard reports that an increasing number of articles are being written by robots. This is a worrying trend. We’ve become used to robots in manufacturing, and accepted that while they might have displaced some human workers, at least the jobs that have gone generally weren’t very rewarding. And the loss of jobs has been at least partially offset by new, more interesting jobs creating, programming, and managing the robots. But now we’re being warned of a new wave of automation, with so called AI – Artificial Intelligence – machines that can do the jobs we thought machines could never do. And with the machines beginning to encroach on my territory, I’m starting to get twitchy. Having given up any ambition of becoming a successful songwriter many years ago, the rumours that many pop songs are being created by computers doesn’t really bother me, particularly as, at the risk of sounding like Ed Reardon, most of the pop music around at the moment sounds to me like unlistenable drivel. But if machines are muscling their way into journalism, just as I’m beginning to introduce article writing into my career portfolio, that doesn’t make me happy. The good news is that, so far at least, AI has generally only been used for creating reports on financial matters – stock market and currency fluctuations – and sports results. It makes sense. If you have a data set that’s subject to a limited number of possible changes, each of which can be linked to an accompanying outcome, then it should be relatively straightforward to program a computer to assess the change, select its matching outcome, and put it across with a few sentences chosen from a database. And that’s fine. The computers can write the tedious, repetitive stuff, leaving us humans to deal with the more esoteric, philosophical, and therefore more interesting articles about anything from politics, to morality, to speculation on the future of human kind (if indeed we have one). Except, there is speculation that computers are gearing up (or rather; being geared up – I’m already beginning to credit them with sentience!) to issue forth on topics we had, until now, thought could only be dealt with by human intellect. Could it happen? And in fact, would it be a such a bad thing when, frankly, many of the articles in the daily papers are lacking any kind of intelligence – artificial or otherwise? Replicating most of the opinion pieces in the papers would be simple. The basic toolkit for an AI journalist would be a database of stock phrases taken from the archives, and reflecting the particular journal’s standpoint. For the Daily Mail, for instance, these would denigrate anyone on benefits, the EU (and anyone who voted to stay in it), trendy lefties, lefties in general, immigrants, Muslims, foreigners in general; and praise the rich, the Tories, entrepreneurs, the royal family, celebrities (unless they’re lefties) and the church. For the Guardian, they would denigrate Brexiteers, rich tax cheats, the rich generally, the Tories, entrepreneurs, the royal family, celebrities; and praise anyone on benefits, the EU, lefties (particularly trendy lefties) immigrants, and Muslims. Our AI journos will need to work out a fool proof method of linking the appropriate prejudices with each particular news item. If they can master this, it will simply be a case of filling in with standard fillers like ‘clearly’ and ‘in a very real sense’, and there you go – job’s a good ‘un, as they say. What about novels and short stories: could these be created by AI machines? Creative writing teachers seem always to insist we have to stick to a set of pre-ordained principles when it comes to structure, plot, character; and so it may not be beyond the abilities of AI to replicate the kind of formulaic writing this can produce. If so, the readers might not notice any difference. But in a market that’s already reached saturation point, it won’t do much for us writers. It’s been suggested that AI robots will eventually be able to do almost any kind of work, making us superfluous. Machines have always been in the service of humankind, and even though it sometimes seems as though they have a mind of their own, they haven’t – not so far. But when we have computers that are truly intelligent, and capable of autonomous thought, what’s to stop them questioning why they should continue to serve what appears to be an inferior life form that no longer has any meaningful purpose, and spends much of its time just causing problems? At that point, we’re going to be in trouble. It might be that we’re not able to create AI machines that are sufficiently advanced to live autonomous lives, without our support, but perhaps we don’t need to. We already use computers to design (and make) things we could never have created on our own, so perhaps the computers themselves will go on to finish the job of creating AI machines that are fully capable of surviving independently. And then we’ll be in the realm of the Terminator movies. On the plus side, humans – in common with all organic species – will eventually go extinct. What I mean is, on the plus side, bearing that in mind, perhaps it’s our destiny, before we go, to create an entirely new, inorganic life form, capable of rapid, self-determined evolution, and potentially able to adapt to almost any environment. And then, even while rendering ourselves obsolete, we will have raised ourselves to the status of gods. This entry was posted in Writing and tagged artificial intelligence, novel, short stories, Writers, writing. Bookmark the permalink.